Today’s report from the Bureau of Labor Statistics showed the economy added 222,000 jobs in June. If this rate of growth keeps up, we should see the economy heading faster toward full employment over the next year. Meanwhile, the overall unemployment rate ticked up slightly to 4.4 percent. This slight increase happened for the “right” reasons as the labor force participation rate rose slightly to 62.8 percent percentage points and the employment-to-population ratio also rose slightly to 60.1 percentage points. As the economy continues to inch towards full employment, we should expect the recovery to reach all corners of the where workers including young and old, and workers of all races can fully benefit from the economy. One particularly bright finding in today’s report is the noticeable drop in the black unemployment rate. While the unemployment rate for black workers remains far higher than for white workers (7.1 percent versus 3.8 percent), the black unemployment rate has been falling faster than overall unemployment over the last year. It’s important to not put too much attention on one month’s data because it can be misleading as the black unemployment rate displays a fair amount of measurement-driven volatility. Looking at the longer term trends, black unemployment has fallen 1.5 percentage points over the last year, compared to a 0.5 percentage point drop overall. Previous estimates indicate that the black unemployment rate tends to be more volatile with respect to aggregate labor market changes than the white rate. Still, this improvement is quite a bit stronger than the historical average of roughly a 2 percentage point change in the black unemployment rate for every 1 percentage point change in the overall rate. This is what we expect to see as the economy approaches full employment and the recovery reaches more people. In particular, as the labor market tightens, the pool of available workers includes a greater share of those who face higher rates of unemployment for any number of reasons. The durability of the 2-to-1 black-white unemployment ratio means that a greater share of those workers is going to be African American. In other words, the progress toward reducing black unemployment so far into the recovery is a function of persistent racial inequality in employment. Another reason June’s black unemployment rate is significant is because it is very close to the historic low of 7.0 percent, reached in April 2000. But, can we really say that the strength of the labor market for black workers is now as strong as it was in 2000? To answer that question, we compare annual average unemployment rates and prime age (25-54 years old) employment-population ratios (EPOPs). We use prime age EPOPS to factor out any structural changes resulting from the growing share of retirees. By both measures, the 2000 market was stronger than the current one. The average annual black unemployment rate in 2000 was 7.6 percent, compared to the current 12-month average of 8.0 percent. While the difference in unemployment rates narrows a bit depending on which 12 months are included in the 2000 average (i.e. Jan 2000 to Dec 2000 versus May 1999 to April 2000), prime age EPOPS show much less monthly volatility. 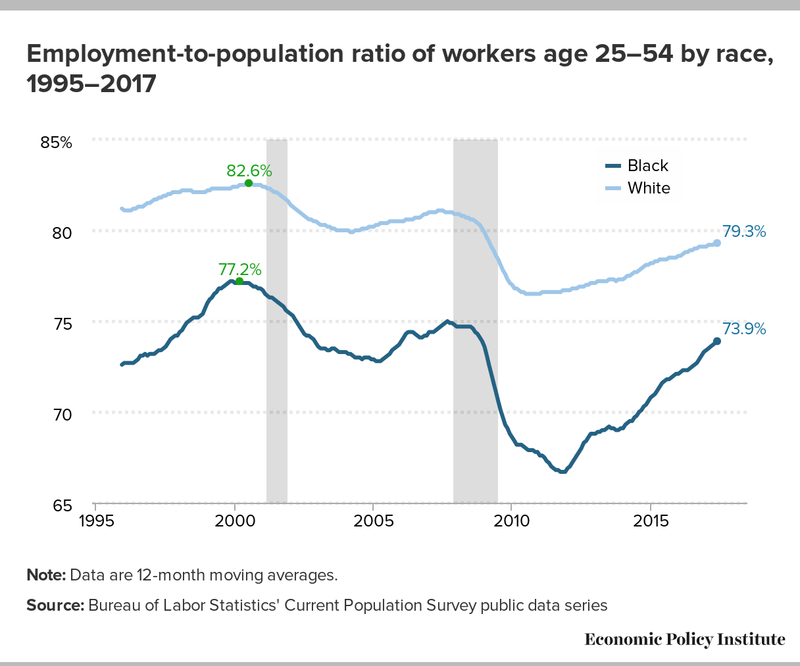 Based on average annual prime age EPOPs, there is no question that a larger share of the black prime age population was employed in 2000 (77.2 percent) than currently (73.9 percent). Note: Data are 12-month moving averages. Digging even deeper to explore unemployment rates by educational attainment reveals other differences between 7.1 percent in June 2017 and 7.0 percent in April 2000. Since 2000, educational attainment has continued to rise for both black and white workers. Black labor force participants with a bachelor’s degree or higher grew from 20.5 percent in 2000 to 29.0 percent in 2017, an increase of 42 percent. 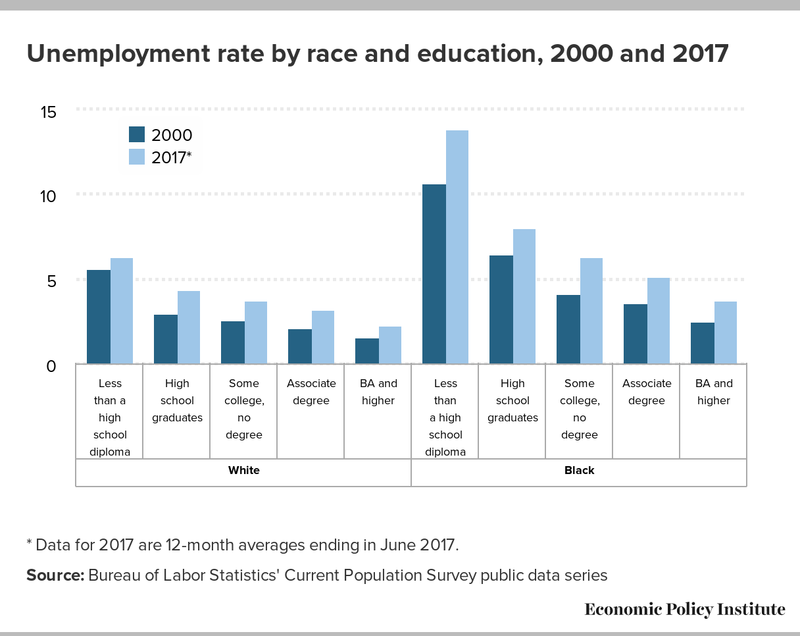 Therefore, the unemployment rate today reflects not only improvements in the economy, but also the fact that black workers today are more educated than ever before. And, with higher levels of education comes lower unemployment rates. In the figure below, you can see how higher levels of education correlate with lower unemployment rates and how unemployment rates within educational categories are still much higher than their respective comparison groups in 2000. 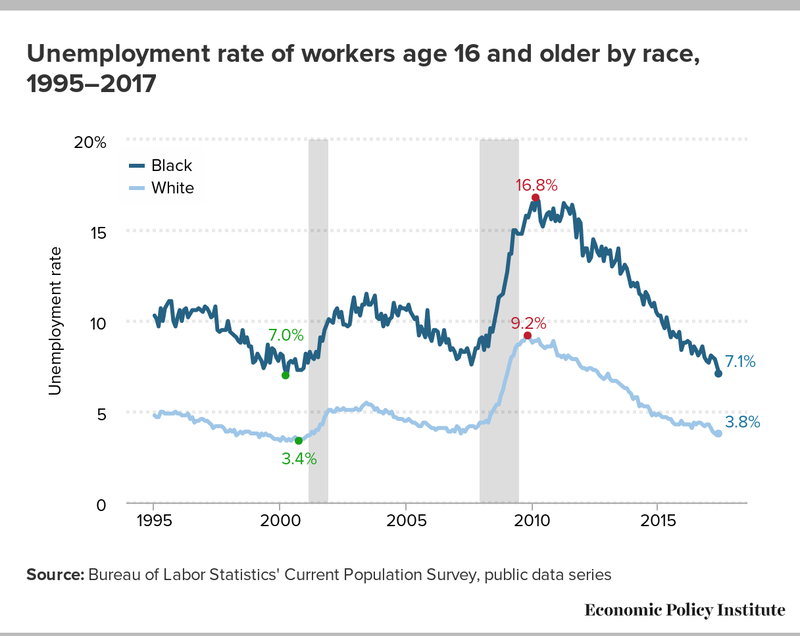 This too indicates a stronger labor market with broader employment opportunities in 2000 relative to today since the economy achieved a slightly lower black unemployment rate when fewer black workers had a college degree. * Data for 2017 are 12-month averages ending in June 2017.